When you pick a writing service, you do it for a reason. 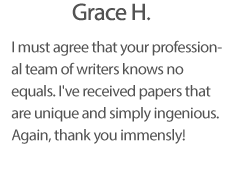 Why should you pay attention to Essay-Writer-Online.org and use its academia writing solution? Here’re 5 reasons that explain why our writing website is the number one choice. We hire experts wielding English as their first language. In additional, holding a degree in a certain subject area is a must. For instance, if you’re interested in a new paper in History, rest assured a specialist with at least Master’s degree in the subject will start on your assignment. Plus, all papers are finalized from scratch. As said earlier, Essay-Writer-Online.org lays focus on authentic content which passes any plagiarism check with flying colors. Our writers contribute to carrying out original papers. Hence, if we have two essay orders places with similar topics from different students, content will still be unique for each of the papers. You’ll be glad to hear more than 85% of all assignments are complete in a timely key. In case an essay or term paper is urgent, timing is always opportune. Fitting into the schedule is first and foremost priority of our dedicated experts. If a deadline is to happen, you’ll be informed in advance via Message board in your Customer area. How value for money at Essay-Writer-Online.org is formed? On one hand, there’s remarkable quality level of plagiarism-free papers we provide. On the other, there’s great respect for our clients and acceptance of the fact that working in a long run is much more rewarding that profiteering here-and-now. That’s why you’ll find our wages so affordable and budget-friendly. We used to be students too, you know? And used to order custom papers from sites available back then as well. That’s why we know how crucial it is to keep all personal and payment data safe. We didn’t want anyone to find out about our writing proves when we were students, and we don’t want anyone to find out about writing prowess of our clients today.